The quiet of an early Sunday morning in Dumfries was shattered by the revving engines of hundreds of motorcycles as Rolling Thunder formed up for their annual Memorial Day Ride to the Pentagon. 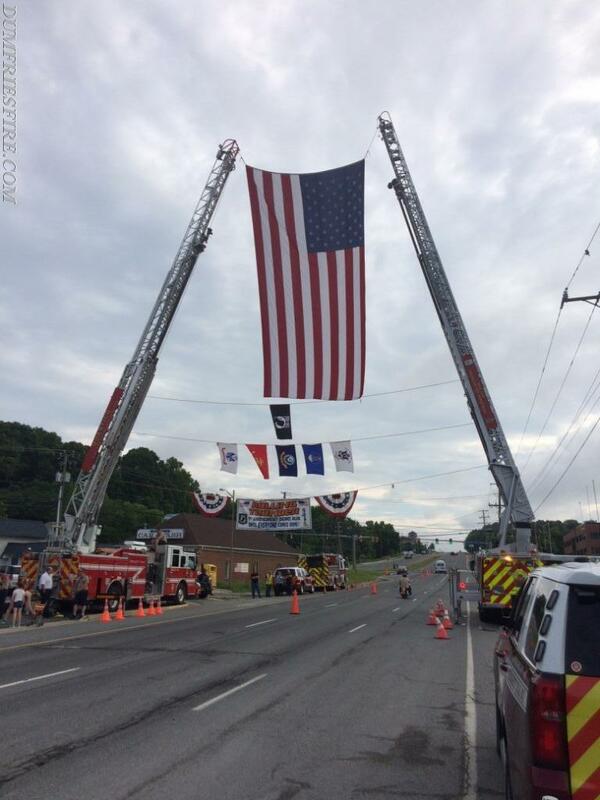 This year once again an impressive flag arch was created across Fraley Boulevard by the Dumfries-Triangle VFD with ladder trucks from the Dale City Volunteer Fire Department and Marine Corps Base Quantico Fire Department. A huge American flag dominated the morning sky flying along with the POW-MIA flag, and the flags of each of the Armed Forces. Engine 503, Attack 503, Safety 507 and Battalion Chief 507 were on the scene and Engine 503 treated one rider for a minor injury caused by an accident just past the starting line. The several hundred bikes roared under the patriotic archway with many giving the thumbs up to the firefighters and taking multiple photos as they road under the gently waving banners. Many thanks to both the Dale City Volunteers and the MCB Quantico Firefighters for the use of the Ladder trucks and personnel that made this presentation possible.